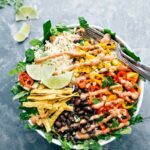 A simple and filling black bean corn salad that is bursting with flavor and can be ready in 15 minutes or less! This black bean corn salad is packed with good-for-you ingredients, is filling enough for a meal, and finished with a simple two-ingredient dressing. If you’re looking to add some meat to this vegetarian meal, use this chicken marinade recipe or steak marinade recipe to add some chicken or steak (both delicious!). One of the most common comments I get from readers is how they need recipes that are quick and easy to prepare, but are also healthy. And as a busy mom of 3, I feel the same way myself. I just don’t have the time or energy to create elaborate meals for my family every day. That’s where this black bean corn salad comes in. This salad assembles in less than 15 minute and has quickly become the recipe I make when I have “no time” to make a full meal. Having quick lunch and dinner recipes (like this one) has been a lifesaver since having a newborn, and I hope this recipe can save you some time in the kitchen as well! I’m not often a proponent of store bought dressings since homemade dressings are more economical, far tastier, and don’t take too long to make. But there’s always an exception to the rule, and this is one of those exceptions. 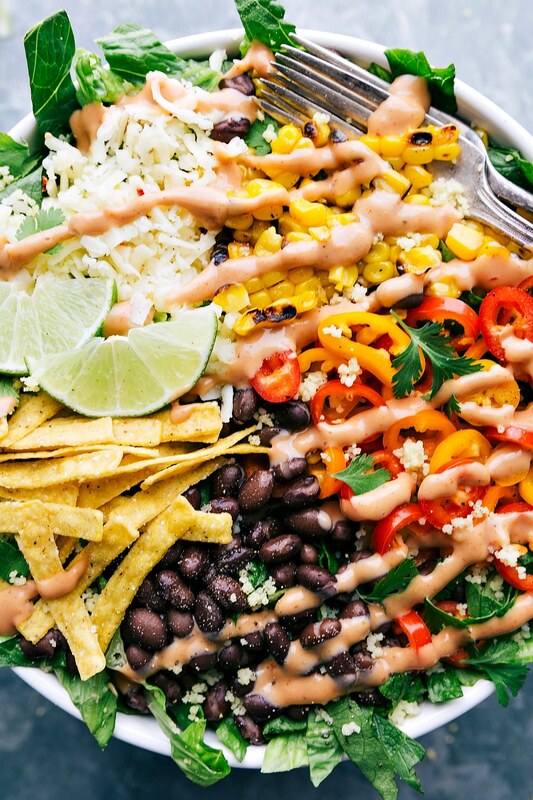 To make the prep time for this black bean corn salad as quick as possible, we’ll be using a store-bought dressing (Jalapeño Ranch) mixed with store-bought BBQ sauce. And despite how simple it is, this dressing works really well in this recipe (and is delicious too!). Make couscous: did you know couscous can be ready in about 10 minutes?! I love the couscous in this recipe as it’s fast to make and helps add “bulk” to this salad, making it more filling. See the below recipe card for directions on how to make couscous. Chop lettuce: Use a bag of pre-chopped and washed romaine lettuce to make prep time even faster. If you have a couple extra minutes, grab a full head of romaine lettuce instead. 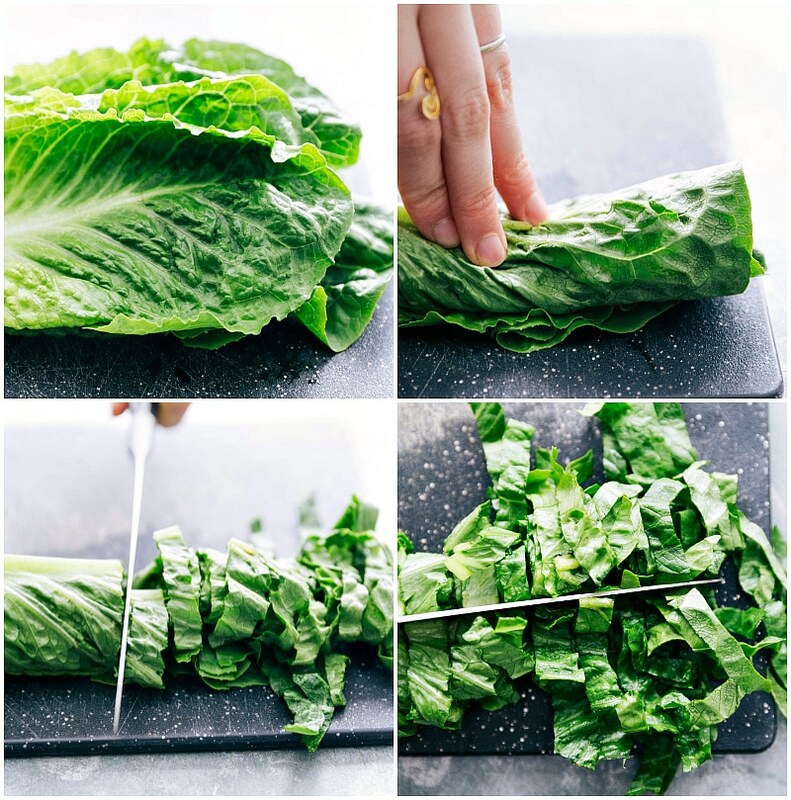 To make chopping the romaine lettuce much easier, stack 4-5 leaves on top of each other, roll them up like a burrito, and make thin vertical slices all the way down. Finish by making one horizontal slice across all the thin slices. See pictures above for how I do this. Make dressing: stir together the spicy ranch and BBQ sauce. Done! Toppings: open cans of corn and black beans, drain and rinse. 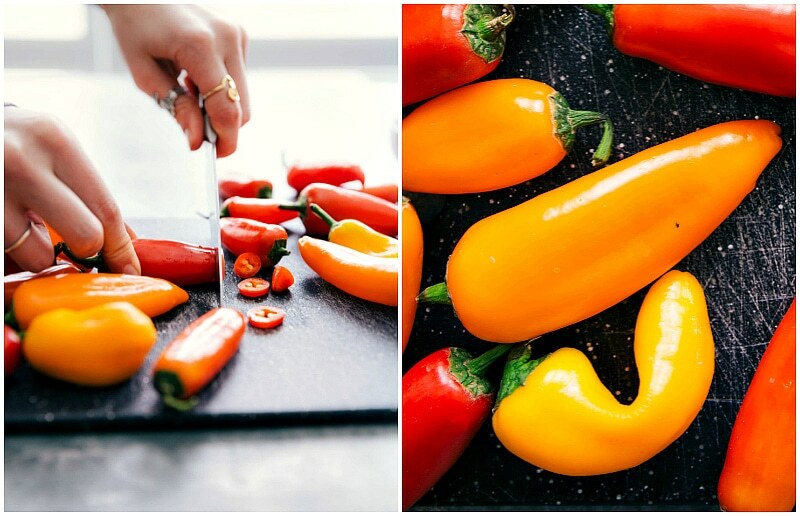 Slice up a few mini peppers, shred some cheese (or buy pre-shredded for even quicker prep), and open up a bag of tortilla strips. 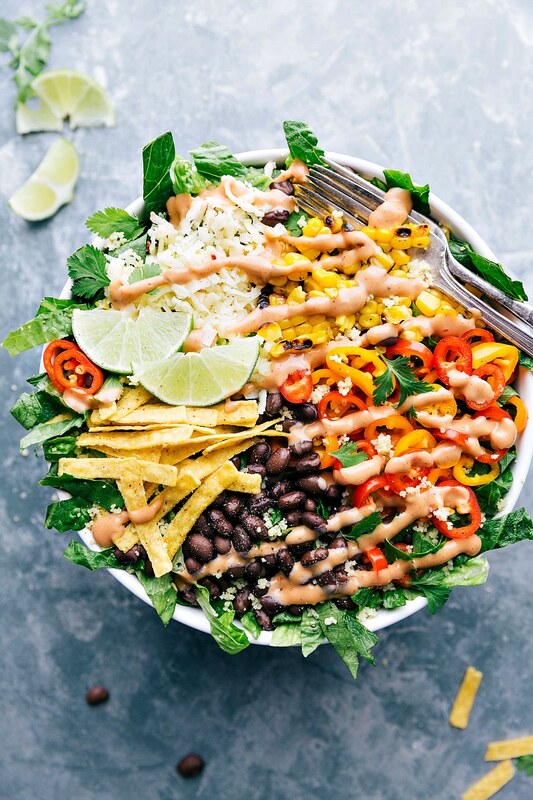 Assemble: toss the lettuce and couscous together, add all the toppings, drizzle the dressing over, and enjoy this delicious black bean corn salad! Add grilled chicken or steak. This will add quite a bit of prep time, but the extra protein makes the salad much more filling. Add a scoop of guacamole OR a chopped avocado to the salad. Add a thinkly sliced red onion. To take away the “bite” of red onion, soak it in cold water for about 5-10 minutes before adding. 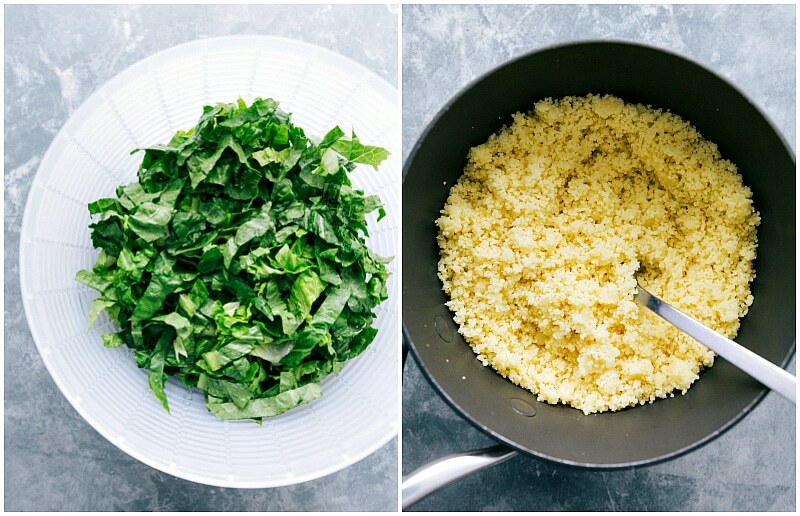 Switch out the couscous with quinoa (here’s my guide on how to cook quinoa). Add some hard-boiled eggs for added protein and flavors. COUSCOUS: prepare the couscous according to package directions (bring 1 cup water or stock/broth to a boil and once it boils, remove from heat, stir in couscous, and place the lid on. Let stand for 2-4 minutes.) Fluff the couscous with a fork (don't let the couscous stand covered for long before fluffing as it gets harder to fluff the longer it sits). Place in the fridge while preparing everything else. LETTUCE: Coarsely chop the lettuce. Wash and VERY thoroughly dry the lettuce (salad spinner is great here). For faster prep, use a bag of pre-chopped and washed romaine lettuce. Add lettuce to a large salad bowl. 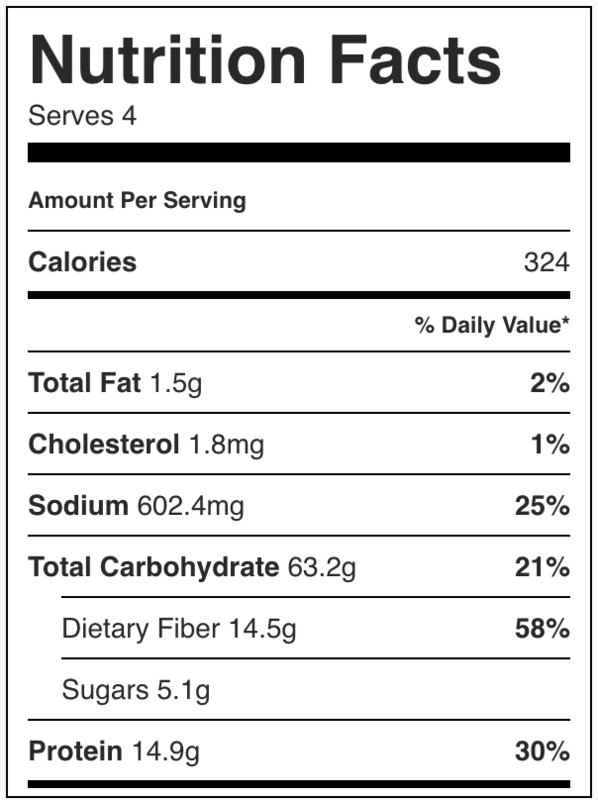 SALAD: Add the drained and rinsed black beans, drained corn, and thinly sliced bell peppers on top of the lettuce. Add the cooked, fluffed, and cooled couscous right on top and toss with two salad spoons until everything is combined. IF eating all at one time, toss salad with dressing in the large bowl (see next step for making dressing). Separate dressed salad onto plates and add pepperjack cheese and tortilla strips in even amounts on plates. IF you aren't eating this salad all at once, toss individual plates with dressing. 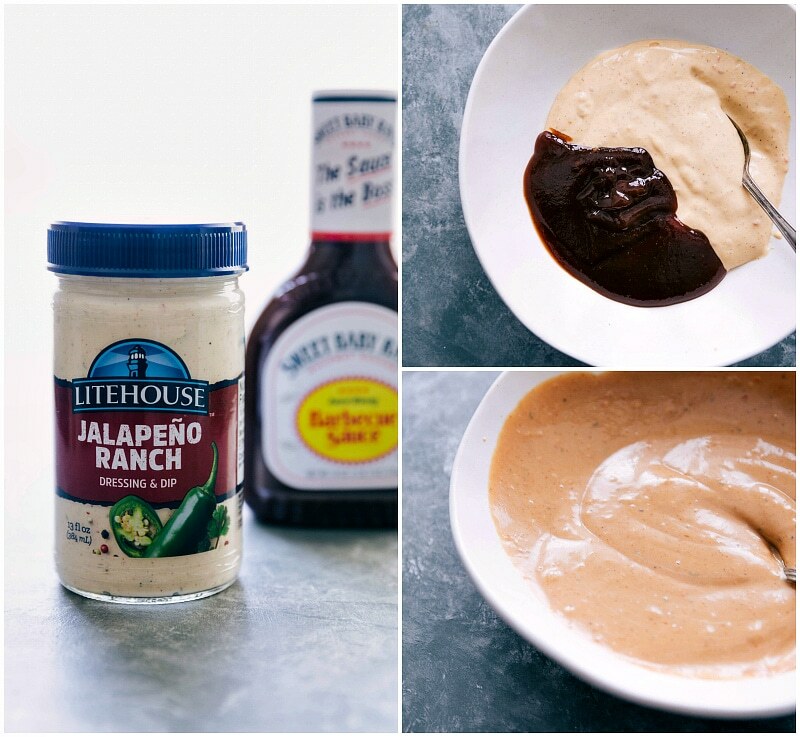 DRESSING: In a small bowl, whisk together the jalapeno ranch and honey BBQ sauce. Drizzle over salads to taste (you may not use all of it depending on how much dressing you like). If desired, add freshly chopped cilantro and fresh lime. Enjoy salads immediately after dressing. A real nice medley of flavors!!!! !